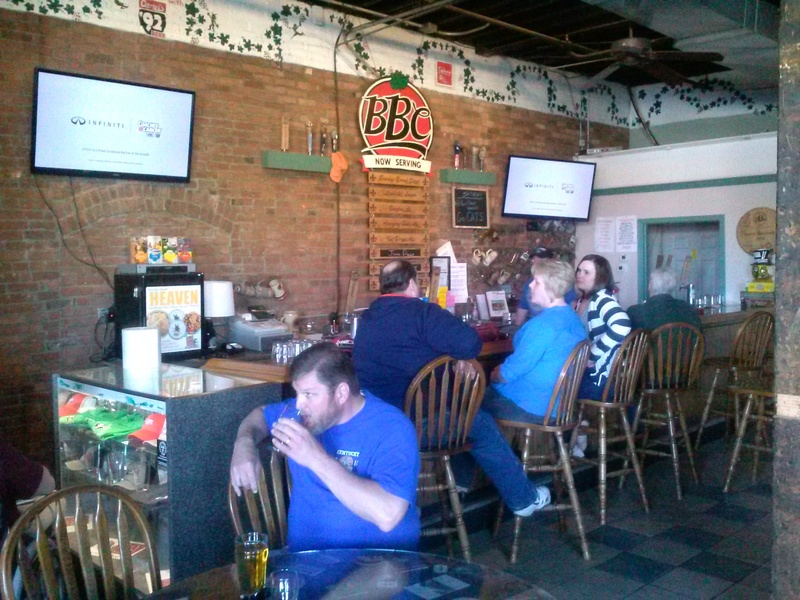 When the current owners of the Bluegrass Brewing Company production brewery at 636 E. Main St. bought the facility in 2005, they considered renaming the business, removing it from under the longtime BBC umbrella. They didn’t, but the idea never came off the table. Amidst a remodeling project already under way in the brewery’s tap room, owners have revealed that in the coming weeks the business will be renamed – and totally reimagined – as Goodwood Brewing Company. Doe-Anderson was brought in as a branding consultant, and the tap room will be expanded and completely remodeled to reflect the new direction. The small museum of local brewing artifacts has been removed, and the space will be converted from what co-owner and president Phil Dearner calls a “grandpa’s basement” feel to a modern environment that will be more like a welcome center, including not just 12 taps and packaged products, but also wine and even boutique brand bourbon. One reason for the re-boot is because while the brewery features the BBC brand, it has long been a separate entity. But most in Louisville don’t understand the divide. The brand has been around since 1993 and hasn’t changed much in that time. The tie-in to the brand, Mitzlaff says, creates “confusion in the marketplace” to the point that at times the taproom and brewery receives calls for hours or reservations at one of the brewpubs around town, all of which are under another ownership group. With new brands getting recognition with beer enthusiasts, Mitzlaff and Dearner said they felt it was time to find their own identity. While they wouldn’t reveal the full reason for the name Goodwood Brewing, they did say that once the final product is unveiled, it will be apparent that the name says plenty about the brewery and the products. In fact, coming up with a name that worked was perhaps the most difficult part. One hint: These guys love barrel-aged beer, so it makes sense the name would reflect that. The tap room will be the face of the brewery, in a way. The original bar will be replaced with a longer, L-shaped bar, and the floors will be re-laid with limestone; the bar top also will be a matching limestone surface. A large archway in the façade facing Main Street will become a window, while an existing front door will be replaced with a large glass entrance that also will welcome natural light into the room. There will be yet-to-be-revealed features that, Dearner says, will make the space unique. In short, the goal is for the tap room to become less an afterthought and more a destination. A new walk-in cooler that will be like a giant beer case is being installed and will be attached to the tap room, as well, but the renovations aren’t just aesthetic in nature. Over the past few months, roughly $250,000 in quality control improvements have gone into place, from improvements to the bottling line, to water and filtration. One new key development will be the use of limestone water in the new beers, a feature traditionally associated with bourbon. The brewery currently has a capacity of 16,000 barrels of beer annually, and in 2014 produced about half that, Dearner says. Part of the change will be to produce more beer and garner more widespread distribution, starting with North Carolina, Illinois and Florida. Basically, the brewery feels the improved product merits a wider audience. “At any time in our history, we’ve never made better beer than we do today,” Dearner says. In addition, in the not-too-distant future, canning will become part of the brewery, starting with mobile canning and ultimately with an on-site cannery. In addition, food will be added to accompany the beer and spirits, although there won’t be a kitchen. Dearing and his team plan to work with downtown restaurants to have rotating food offerings available. As time goes by, food trucks will be added into the mix. Meanwhile, the BBC face of the tap room continues with its usual beer selections, occasional events and twice-monthly yoga on Saturdays. Soon, however, the Louisville beer community will have a new player with a new name, but with plenty of familiar faces behind it. Mitzlaff and Dearner feel certain it will be welcomed. “The Louisville beer community is a wonderful community,” Mitzlaff says. This post was originally published by Insider Louisville.